China has the fastest Supercomputer in the world according to latest 41st edition of TOP500 list of the fastest supercomputers in the World. Called Tianhe-2, the fastest supercomputer is developed by China’s National University of Defense Technology with a performance of 33.86 petaflops. If you do not understand how much a petaflop is – here is a simple definition. One Petaflop is equivalent to 1000 teraflops (trillion floating point operations per second). United States has the second (Titan) and third (Sequoia) fastest supercomputers. In Top 10 ranking, United States has 5, China has 2, Germany has 2 and Japan has 1. The Chinese topper, Tianhe-2 is not only the fastest, but by a very long margin as well. It is nearly twice as powerful as 2nd ranked Titan. 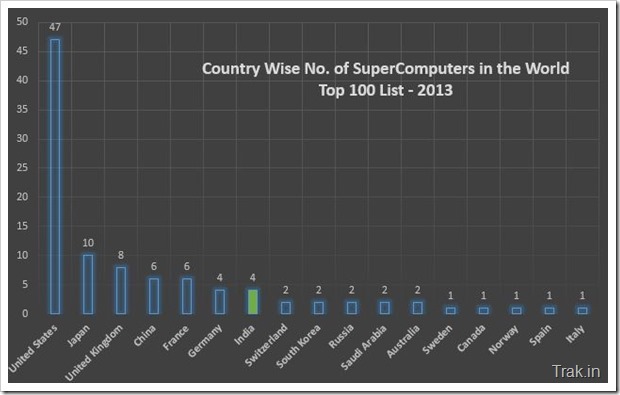 While India has performed much better compared to November 2012 list when India had only 1 Supercomputer ranked at 86th, still at a global level India is far behind as far as super computing goes. If you rank India’s fastest super computer with Top ranked Tianhe-2, it really shows the how far behind India is in Supercomputing. Tianhe-2 clocks 33862.7 Teraflops power as compared to Indian iDataPlex which is fastest at 719.2 Teraflops. In sheer numbers United States is far ahead with nearly half of all the Supercomputers in Top 100 developed in their country. Japan has 10 while UK has 8. Even though we pride ourselves to be an IT / Software hub, it is really sad to see that India lags so behind in Supercomputing. Infact, over the years other countries have progressively gone ahead of us. Imagine this, in 2007 India had fourth fastest Supercomputer in the world! "4 Indian Supercomputers Make It World’s Fastest 100", 5 out of 5 based on 1 ratings. Airtel Digital TV Launches Free Ad-Based Pay Per View! Wow, the United States has over 45 supercomputers! Yeah China eventually reclaim its top position which it lost to Japan’s K computer few years back….It is good to see China surpassing US…It was US’s Titan supercomputer which was the ex fastest supercomputer of the world…I hope Tianhe-2 will be able to hold its position for a few months at least…..
Coming back to India’s success, yeah I am really happy, and I think our country should deploy it (at least one) to the defence sector…. You right ! so i think INDIA can do that.